The Galaxy S is certainly a looker, with its vibrant four-inch screen. However, it might be worth investing in a protective case because it’s surprisingly light. It’s easy to find your way around the Galaxy S’s bursting bag of features, thanks to the menu systems, and even setting up email is easy – just type in your address and password. With a feature set including a powerful processor, stunning Super AMOLED display, Wi-Fi, HSDPA, A-GPS, a five-megapixel camera and access to the Android Market, the Samsung Galaxy S boasts enough to make any smartphone envious. The Samsung Galaxy S impressed on all counts, although gaining an A-GPS fix took longer than we had hoped. Battery performance was average with 390 minutes of talktime (3G) and 576 hours (3G) of standby time. Running on Android 2.1, and with its giant Super AMOLED display, powerful processor, and excellent multimedia functions, what's not to like about the Samsung Galaxy S ? When Apple brings out a new iPhone, it's usually a signal for other handset manufacturers to up their game if they want to compete. And for a while now, we've felt that Samsung hasn't quite been stepping up to the plate, introducing good, but not excellent phones. While we weren't completely in love with Samsung's Wave, we can now declare that we are completely enamoured with its latest offering - the Samsung Galaxy S .
First, let's look at the basics. 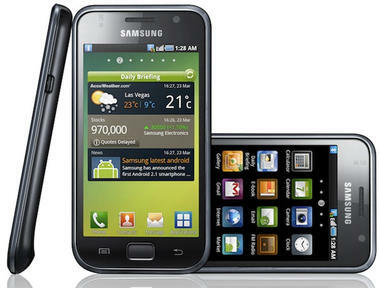 The Samsung Galaxy S is a capacitive touch-screen handset with a massive four-inch screen. Putting it ahead of the pack is Android 2.1 (aka Éclair) - most Google phones run on 1.6. In the recent past, we've not been kind about Samsung's designs as we've found them all much of a muchness. The Jet blends into the Blade, which blends into to the Monte, and so on. However, the Galaxy S is like no other, well actually, don't say this too loudly, but it's rather like an iPhone - an iPhone 3GS we should say, not an iPhone 4. While Samsung may not thank us for making the comparison, remember that the iPhone is an eye-catching handset. The back of the Samsung Galaxy S feels like tempered glass, with a slight chin at the bottom of the handset. We're assuming this helps to protect the camera lens by lifting it slightly when the phone is placed on a hard surface. The Galaxy S feels light - in fact it's so light that you might want to splash out on a protective case - we'd be worried if the phone got dropped on the floor. Your experience of this kind of phone depends on the touch-screen, and happily the Galaxy S has one of the most fluid and responsive screens we've ever used. The only front-facing keys on this device are a touch-responsive menu key, a sunken (and very slightly creaky) D-Pad, and a back button. After all, with a touch-screen this effective, who needs a load of hard keys? However, it is a shame there's no dedicated camera key. We'll go into the camera in more detail later, but as phone cameras are invariably used for spontaneous snaps, it seems a bit of a faff to have to go into the Galaxy S's main menu to start up the camera. By the time you've done that, it's likely the moment will have passed. The vibrant screen is one of the Galaxy X's top features. It's so stunning, you might find yourself unlocking it just to marvel at its sparkling beauty. Icons are crisp and look like you could reach in and take them out of the display. The seven home screens can be customised with a wide choice of wallpapers and ‘live' backgrounds (as well as your own photos). The odd thing is you can't add a different background to each home screen. Okay, so once you start putting different widgets and shortcuts on each page, you'll be able to differentiate between the screens pretty easily, but it does seem a touch strange. Of course, because it's an Android device, Galaxy S owners can get themselves an ever-increasing number of apps from the Android Market. That's lucky, because Samsung's own app store has a pretty poor number on offer. However, it's early days yet, so we'll give Samsung time to improve their offering. However, with the Android Market to browse through, we can't see buyers knocking on the door of Samsung's store. We also really like the way you can assign specific folders to your home screens - in the same way as you would on a Mac or PC. Set up a folder of contacts for your footie team, for instance, or for work contacts. It's easy to add a folder, widget or shortcut; just hold your finger down on the home screen until a menu option pops up. The touch-screen makes it simple to swipe between screens, and it also boasts one of the most finger-friendly virtual QWERTY keyboards we've used. Turn the handset into landscape mode and you'll get a more sizeable keyboard, but even in portrait mode it was easy to bash out texts and emails with few errors. A nice touch is the ‘@" and ‘.com' keys that are automatically added to the keyboard when you're typing in an email address field, and a ‘www' when typing in a URL. Samsung has come up with a new way to type, with its ‘Swype'. We have to admit that we were sceptical at first, but no more. This is how it works; drag your finger from one letter to another. Lift your finger off the keyboard and your word is spelled out before your eyes. Adding punctuation is a bit tedious, so is likely to be overlooked, but it's an innovative idea and works really well. The only minor problem is that on occasions your finger blocks the next letter you want to slide to. We found setting up emails a doddle - just enter an email address and password. It's possible to set how often mail is sent to your handset (anywhere between once an hour and every five minutes). You can also choose to manually ‘pull' messages when you need them. The Samsung Galaxy S supports multiple accounts, and the pre-embedded ThinkFree Write app means you can read Word documents attached to emails. At the top of the screen, the notifications bar is where you will be alerted to any emails or messages, as on other Android phones. There's an added twist on the Galaxy S, as Samsung has added one-button access to switch on Wi-Fi and Bluetooth, as well as a Silent and Vibration mode. Browsing the internet is speedy on the Galaxy S, whether it's on Wi-Fi or via HSDPA - thanks mainly to the ARM Cortex A8 1GHz processor. Of course, such a fantastic screen enhances any internet experience, and being able to open multiple pages and search for specific words are added bonuses. And because the Galaxy S is an Android 2.1 phone, you can enjoy the same pinch and pull multi-touch facility that iPhone users benefit from. It works really well, allowing you to zoom in and out of a web page with ease. An additional treat is that you can click on the microphone next to the web address bar and use voice activation to start a Google search. We'd like to see people's faces when you shout "football' at your phone on the bus, but it does work well. It's just a shame that Android 2.1 is still not able to play Flash video -but the 2.2 upgrade should sort that out when it happens. While the Galaxy S is lacking Flash video, in its favour it does have a dedicated YouTube app - and we loved it. Videos were streamed immediately, and on the high quality setting the clarity is amazing. In fact, we're not sure why you'd ever use the normal quality option. The Galaxy S proves itself a multimedia giant, supporting all major video formats and including a 3.5mm headset jack, so you can plug in your earphones if you want (mind you, the included set is pretty decent). The device is also DLNA compatible, so you can remotely play movies and music, and slideshow any pictures you have saved on your phone on a big screen, as long as it is DLNA certified. Video recording is also made to impress, shooting HD 720p@30fps - that's DVD quality to the layman. Impressive shots were also taken by the five-megapixel camera, which offers a host of features to help you make the most of your images. The touch focus is a particular favourite - want a particular area of the photo to be sharper? Just touch it! Face and smile detection worked well too. The missing flash is a bit of a shame, but it has to be said that Android phones are not generally known for their cameras, and the Galaxy S is no exception. What we found most disappointing was the sat nav offering. While the Galaxy S has assisted-GPS, it took a long time to get a fix - pretty surprising considering the ARM Cortex A8 1GHz processor. However, once it achieved its fix, it was consistent and the massive screen and the wide choice of navigation apps from the Android Market make it a contender when it comes to replacing a dedicated sat nav device. The Samsung Galaxy S makes it into our phones of the year list - it's one of the most powerful smartphones we've seen, and the screen is stunning. Its design is not its strongest point, but it's good-looking enough, and the web browsing experience more than makes up for it - especially with the added bonus of multi-touch thanks to Android 2.1. But what we were most impressed with were the multimedia capabilities of the Galaxy S.
Videos look exceptional on the large Super AMOLED screen - whether you've shot them yourself, side-loaded onto your phone, or streamed via YouTube. Being able to watch them on a compatible computer or TV via DLNA is a bonus. Let us sum this up - if you want an all-singing, all-dancing handset that doesn't have any kind of fruit in its name, choosing the Samsung Galaxy S is a no-brainer.